Recently I started reading this book named 'My life as a quant' by Emanuel Derman who describes his life in a very intense and heroic way . He relates his experiences of school , and how , by a sheer luck of chance - he gets to study in America . He defines how physicists like himself have an added advantage on the Wall Street, where people like Derman compile their knowledge of mathematical algorithms, financial data and prowess , and strong computer skills (essentially C++) . Quants , as they are known, are very different from day traders or investment bankers - which is why they are never in public limelight but get a lot of money for their work. He joined Goldman Sachs way back in 1985 and has learned that some projects have to be shelved to complete more important work, and then others have to be sacrificed to do the previous unfinished projects. This work can be compared to counting ripples in the lake -- there is no end to the work you have to do in this profession. I have been moved by this profession very much - which is called in modern terms as financial engineering [ ya you got it right - the mix of finance and engineering--two relatively different term]. 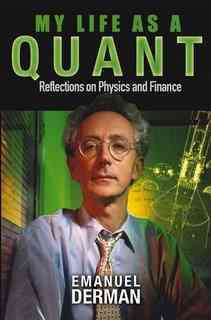 I've still not finished my reading(i'm a bit slow...) but recommend the book for anyone who is knowledge hungry and wants to know more about quantitative finance and quants. Thanks for commenting on my blog. I really enjoyed Derman's book. In graduate school I was the only student in our nuclear physics theory group that ended up staying within the field. Two guys went into finance, one ended up becoming a theoretical neuroscientist, and I became an experimentalist. However, with the proliferation of financial engineering graduate programs I wonder how those with physics PhDs will do trying to break into finance.